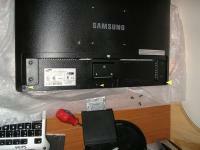 So you've just bought a shiny new Samsung 226BW that was supposed to be the latest greatest killer LCD on the market. There's only one problem, it doesn't look quite the way that it should. You look online to see if there is anything special about adjusting the colors or contrast and you find out some shocking facts. There are actually 3 different LCD panels that are marketed under the 226BW model umbrella. There are "S", "A", and "C" models. "S" is the highest quality and the panel is made by Samsung themselves, this is the panel that they sent out to reviewers. "A" is made by AU and is of slightly lower quality, but it can be calibrated to almost match the "S" panel. The "C" model is the worst of the batch and is made by the Chei Mei corporation. This panel has quite pronounced backlight bleeding issues as well as a very bad color profile by default. If you haven't read up on these issues then you should read these articles by BeHardware that explain a lot about the situation. So now that you have the facts, you will want to find out what kind of panel you own. The first two methods are fairly simple and you will have read about them in the BeHardware articles, but I will reiterate them here for you. The first method is certainly also the simplest. 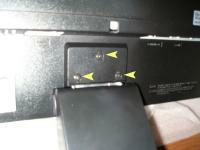 At the back of your monitor, remove the plastic cover that hides the power and VGA/DVI plugs. Underneath in the left hand corner you will find a sticker that gives you some info about your monitor. 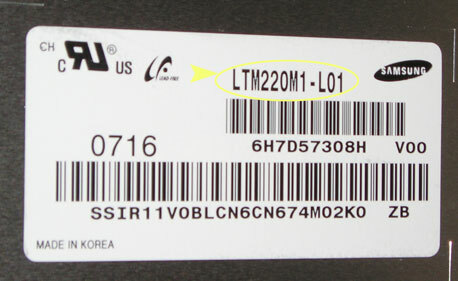 At the top, beside the model number there should be a letter indicating the panel type. You should see "S", "A", or "C". Simple right? There are a couple of problems with this method. 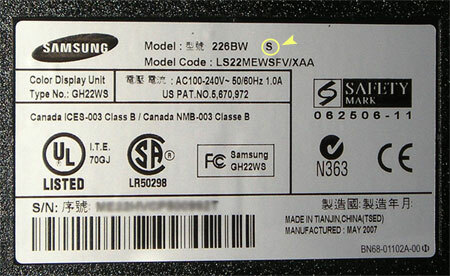 First, apparently Samsung has been known to put a different panel inside than the letter on the sticker indicates. Secondly, as with all of the methods we will mention, you actually have to have the monitor out of the box and in your hands. There is no way to tell the panel type from the sticker on the box. Thirdly, and most disturbingly, the letter may be missing from the back of the panel. A lot of the newer panels are coming without a letter on the back sticker, leaving the bewildered owners wondering if they are holding a gem or just a lump of coal. This brings us to the second way of divining which panel is inside your 226BW. There is a secret service menu hidden away from the prying eyes of consumers. This service menu will contain the panel type most of the time. To access said panel, simply lower both the brightness and the contrast to 0 using the regular user control panel. Exit the menu, and then bring it back up again. After you have done this hold the source button down for 5 seconds. This will bring up the service menu. The panel type should be located down at the bottom underneath the Scaler-MCU entry. But Wait! It's missing! Yes, on my monitor the panel type was missing from the service menu. As it turns out this is becoming a more common occurrence in the newer revisions of this monitor. If the panel type had been there it would have started with "AU" for an "A" panel, it would probably have contained "220M1" for an "S" panel, and started with "CMO" or "CPT" for a "C" panel. Some of the other sites have a little more information regarding which model numbers belong to which panel. Since my monitor was missing its panel type in the service menu, I became very curious to know exactly what panel was really inside my monitor. I decided that I would take it apart and see. As it turns out this was not too extensive of a job and almost anyone with a philips screwdriver could do it. I should note here that if you attempt this on your own monitor I take no responsibility for any and all damages that may occur. Also please note that by doing this you are certainly voiding your warranty in the eyes of the manufacturer, even though the process of disassembly leaves no visible marks. That being said I will proceed with the gutting explanation. 1) Turn your monitor on its face on a clean surface that is free of any protruding objects. It would be wise to place a cloth underneath it to mitigate any chance of having the screen screen scratched. 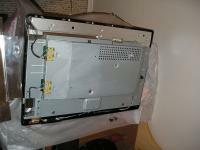 2) Remove the base from the monitor and then remove the three screws that attach the base mount to the main panel. Pull the base stem down and out of the monitor. 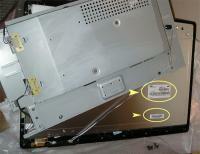 3) Remove the three screws along the bottom of the monitor as indicated by the arrows in figure 3. Once this has been accomplished gently pry the back off of the monitor using your fingers. There should be no need to use a screwdriver or even to use a lot of force as the parts come apart fairly easily. Remember to take your time so that you don't wreck any of the plastic molding. 4) Once you have the back off of the monitor remove the silver shield located on the left hand side of the panel. This should come off easily and has no screws. 5) With the shield off you should be able to lift and slide the the metal container that houses the power and video circuitry so that you can see underneath. Remember not to slide it too far as it is still attatched with wires to the main panel beneath. Now at last we are able to read the prized stickers on the back of the panel that will tell us for certain who the manufacturer is. There should be 2 separate stickers located on the back of the main LCD panel. You can look up your model number on the web to find out who made it. As it turned out my panel was actually manufactured by Samsung after all. That's all there is too it. 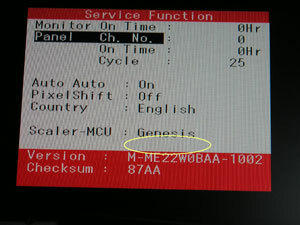 Reassemble your monitor with care, and post your results on the forum. I want to say as a last parting shot that I think that the marketing tatics employed by samsung with this monitor are rather despicable. Its not fair to your review sites, retailers or customers to send your best panels to reviews and then let your customers play the panel lottery to find out what display they get. Maybe if all of us let Samsung know our displeasure in the matter we can get this matter resolved. I hope you've enjoyed reading this little article as much as I had writing it.